Warning: Reading this story may be hazardous to your productivity. The Web sites within may divert you from the dull tasks in need of your attention and may cause you to goof off for hours instead. Oh, who are we kidding? You weren't going to get any work done today, anyway. So you might as well waste time in style--and these sites will help you do it. Figuring that you're already familiar with the Facebooks and YouTubes and Onions of the Net, we decided that any further serious undermining of your motivation to labor entailed digging up some obscure nuggets to commingle with the more familiar destinations. Our only criterion: Every site should be entertaining and habit-forming. And we found 'em--40 of 'em. Now just put up your privacy screen, kick back, and start clicking. Caveat: If you get caught, it won't do you any good to tell your boss that we're the ones who suggested it. And let me say for the record that I didn't waste any time on the organization of this list! The author of this story places himself on the left and his PC World editor on the right. Hey, get your mind out of the gutter--Stripgenerator is about comic creation, not clothing removal--though we wouldn't claim that the two paths have never crossed. 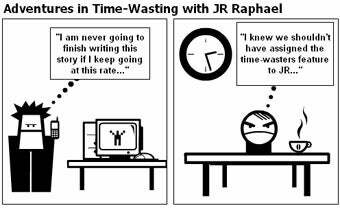 The site lets you build your very own customized comic strip in a matter of minutes. Choose from an array of characters and objects, and then bring your strip to life, one square at a time. If you're feeling particularly adventurous, sign up to start your own "strip blog" and have your content featured on the site's home page. FMyLife (the site isn't entirely clear about what the "F" stands for, but "Flee" wouldn't be inappropriate) encourages people to send in anonymous real-life stories of worst-case scenarios that came horrifyingly true--things you'll just have to read to believe. The stories aren't always G-rated, so visit at your own discretion. A must-try for any music or film fanatic, LivePlasma helps you find new movies and music by building interactive maps around your current favorites. It's like six degrees of separation, customized to your cultural interests. The onetime competitor to Mad Magazine has reinvented itself as a Web site for all things funny. Cracked has an array of amusing lists, stories, and videos that'll keep you laughing for days. Add some pizzazz to your profile pic with BeFunky.com. The site's Web-based application lets you easily morph any photo into a cartoony character or Warhol-like painting. Grammar geeks will delight in Funny Typos, a site devoted to ridiculing the language-challenged among us. Why people cant menage to reed there writhing batter is simpy a misery to me. Would you care about this fine if you touched the wires? Do park visitors generally need to be told "Please do not sit on crocodile"? Must employees at a company parking lot be reminded "Do Not Sleep Below the Vehicle"? Silly as these things sound, they're actual warnings posted on public safety signs. Safety Graphic Fun works to compile the most ridiculous placards, outlandish announcements, and attorney-inspired posterior papering from around the world, some of which are astonishingly absurd. 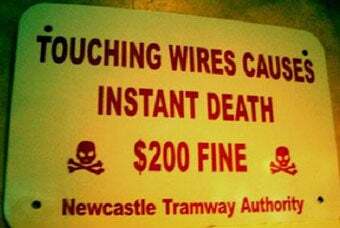 My favorite: "Touching wires causes instant death. $200 fine." Go old-school and play dozens of original Nintendo games online. Once you get accustomed to the keyboard-based commands, even the most determined Koopa Troopas won't be able to pull you away. Find a wider selection of time-wasting games at Pogo. See if you can spell success in Scrabble, dominate at Dominoes, or ride the Reading Railroad to a sweet Monopoly victory. Interact with total strangers in the strange new world of Omegle. This simple site pops you into a one-on-one chat room with a random person, and there's no telling where the conversation may take you.